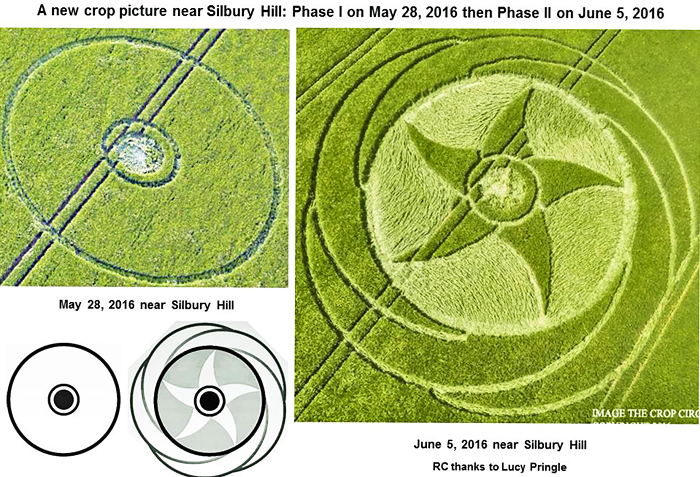 On 28th May 2016 has appeared the Phase 1 of this crop circle. According to the Mayan calendar, 28th May 2016 is a day with the Solar Seal “Yellow Sun” and with Tone 4. This is the 4th day of the Yellow Castle with main energy Yellow Sun. This is also the 4th day of the Red Earth Wavespell, the first wavespell in the Yellow Castle. The Yellow Castle continues 52 days. The big circle represents the Earth globe and on this way is depicted the energy “Red Earth”. The small circle in the center depicts the Universal Fire and symbolizes the energy Yellow Sun. So, on 28th May 2016 on the Earth is ignited the Universal Fire. The implementation of the programm of the Yellow Sun begins. In the previous 4 castles run processes of preparation, purification and transformation of the structures in crystalline ones, which can retain more light. Now in the Yellow Castle these structures are filled with light, this is the process of Ripening, or Enlightenment and Ascension. 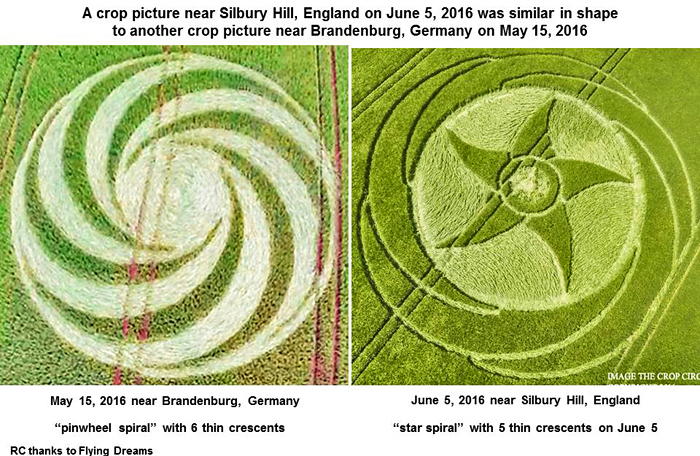 The Phase 2 of the crop circle has appeared on 4th June 2016. This is again a day of the Red Earth Wavespell in the Yellow Castle. Red Earth, Yellow Sun and White Wizard. 4rd June 2016 is a day of the White Wizard Year, which began on 26th July 2015 and continues until 25 July 2016.
below – the two legs. Here the White Wizard symbolizes the Human, or the Humanity in general. In the White Wizard Year we become more receptive to the cosmic energies and learn to act like Wizards – we learn to use all energy tools in order to co-create the desired reality. Energy tools are for example: thoughts, thought-forms, dreams, goals, wishes, intentions, visualizations etc. Like in Phase 1, the big circle represents the Earth. Round the earth globe we see “spiral sleeves”, which symbolize the “spirals of the Evolution”. The energy Red Earth has following qualities: Evolution, Navigation, Synchronization. We learn our lessons on the Earth, she is our Navigator on the path of the Evolution of the Consciousness and help us to synchronize ourselves with the energies of the Universe. The small circle in the center symbolizes again the energy Yellow Sun (Enlightenment, Ascension, Universal Fire, Life) – the main energy in the current Yellow Castle. Now the Universal Fire is “ignited and burns in the heart” of the White Wizard, i.e. in the heart of every Human. During the Yellow Castle each of us has the possibility to accept and integrate the energy Yellow Sun and to go forward on the path of the Enlightenment and Ascension. Gratitude to the photographers ! 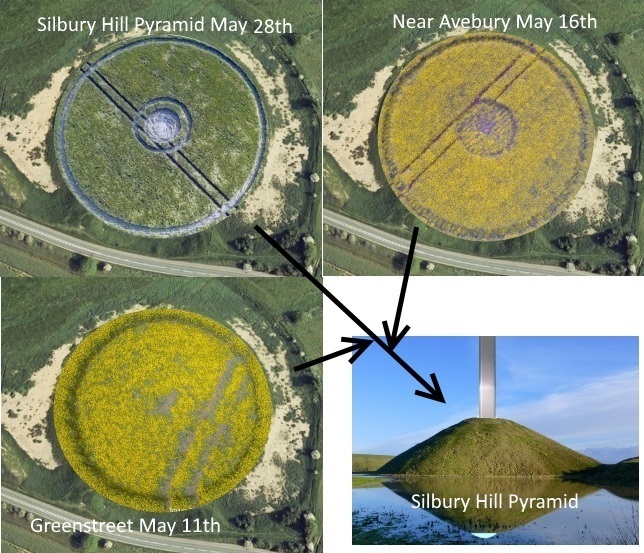 Once I had seen the latest crop circle posted on the Crop Circle Connector, I was immediately reminded of the three stages of construction it took (over a period, perhaps of 10 – 15 years, a community of workers, perhaps 500 – 700) to build Silbury Hill as it has been standing for approximately 4,750 years. 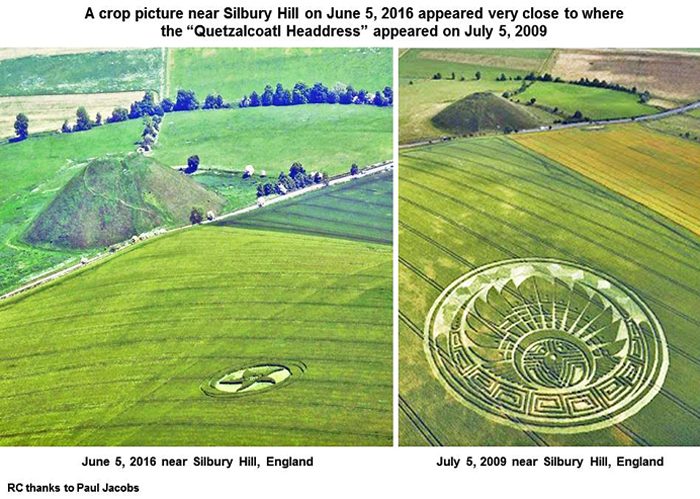 This last crop circle definitely looks like Silbury Hill as viewed from directly above, and the proximity to the mound itself gives us a not too subtle hint that the formation pertains to Silbury Hill. Computer rendering of complexity of construction at Silbury Hill in the Late Neolithic Period (2490 – 2340 BC). Radiocarbon dating taken from a fragment of antler found against a chalk wall in the mound. There have been many formations appearing over the years at Silbury, but I am inclined to ask the question why this obvious one. 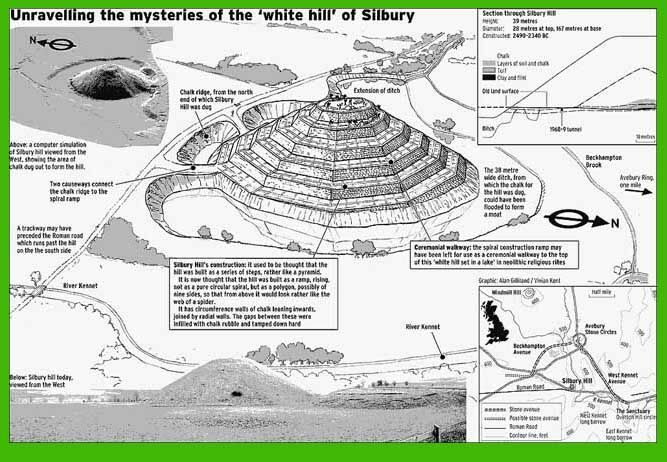 My question is partly answered in the context of the two preceding British formations, at Eastfield and Greenstreet; the three formations together describe in succinct diagram form, the 3 stages that were involved in constructing the ancient landmark now named Silbury Hill. So this series seems to point to an emphasis on the importance of this site and the significance of the human effort and attitude that initiated and completed the great mound. Three stages of building that took place over a period of perhaps 10 – 15 years. “No burial was found. Why would there be? Is it not more likely that the tale of King Sil and his horse refer to the Sun? Or perhaps the great chalk mound, gleaming white before the grass grew over it, reflecting the light from the sky into the encircling waters was a symbol of the moon. Certainly most theories assign a feminine principle to this landscape and while the part of the male may not have been fully understood, the gravid belly of the female that mysteriously brings forth life would have been revered. 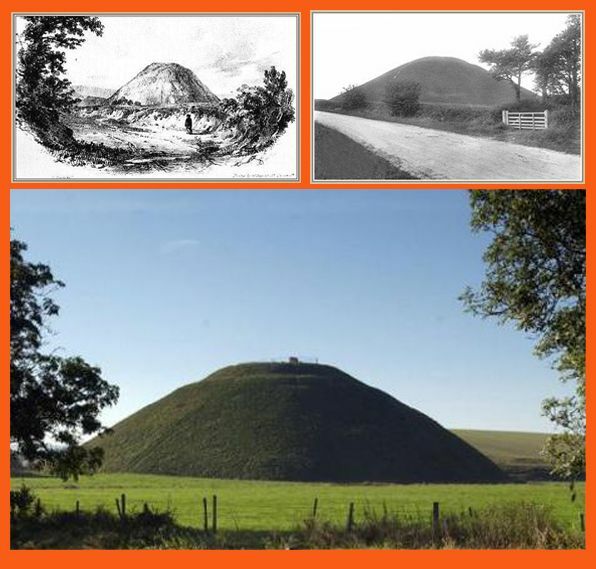 Silbury Hill as seen during more recent ‘thens’, and now. 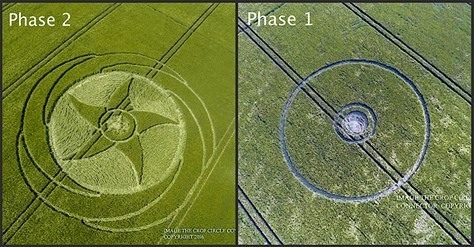 Could these three crop circles be directing our attention to a time when reverence for Nature and the Earth was so strong and embedded in life that great thought, effort and energy was put into honouring them. These formations are so gently, beautifully and kindly reminding us of the Source from which our own lives, inspirations AND technologies arise. FOR OUR OWN SAKES, IF NOT FOR LOVE OF THE PLANET, WILL WE FINALLY TURN OUR CONSCIOUSNESS TOWARDS THE WAY THAT NATURE AND LIFE SHOW US? The Evolution and The Transformation. The following is based on my revised theory of the Maya-researcher Calleman, which implies that the so called nine Underworlds end on the very same date, namely October 28, 2016 (instead of October 28, 2011). Silbury Hill symbolizes the relationship between the Upper World and the Underworld. 1 The time span between May 28 (date phase I of the formation) and October 28 is five Gregorian months. 2 The time span between June 4 (date phase II of the formation), beginning of the day and October 28 (end of the day) is precise five lunar months (identical lunar phase). This relates to the five “crescent moons” of the formation. 3 October 28 falls 146 days after June 4, which is exactly two fifth of a year (2 × 365 / 5 = 146). Hence, in this case the five elements of the formation relate to the division of the year in five parts of 73 days each. B the ninth underworld, which was erected between September 16 and October 28 of the year 2011. A The relationship with the erection of the world tree of the Great Cycle is found by finding the date in the year -3113 around May 28, which at the same time was characterized by half moon, waning. This was the day May 25 (proleptic Gregorian date). A calculation program reveals that this date fell exactly (153 × 20 + 1) × 4 × 153 days before May 28, 2016 (phase I of the formation). Note the double relationship with the time span of 153 days (in one case with a difference of one)! B The relationship with the erection of the world tree of the ninth Underworld is found by finding the date between September 16 and October 28, 2011, that is close to October 28 (exactly five years before the end of the underworlds) and at the same time is characterized by the same lunar phase as the day of the formation (May 28). This is the date October 19, 2011. It turns out that October 19, 2011 falls exactly 11 × 153 days before May 28, 2016 (phase I of the formation) and 12 × 153 days before October 28, 2016. The triple relationship with 153 days in the past relate to the 153 days (5 Gregorian months) in the future. This is compelling evidence that we should consider October 28, 2016 as the end date of the nine Underworlds. One of the five points of the formation point towards moonset (265 degrees East of North) on October 28, 2016. This crop circle was presented in two stages, the first showing only the central circle and ring inside the outer ring. This meant that a comet with a coma is now positioned to strike Earth (at night). The five fire-like figures stand for the fiery appearance of the comet and four fragments as it is seen later falling to Earth. The outer five figures represent the gas and smoke observed in the comet’s tail right before impact. The comet is probably A.